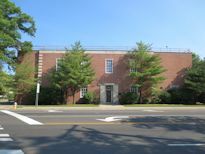 The following are representative examples of telephone central office buildings in Area Code 516 (western Long Island, NY - Nassau County). Cross-border office where the prefixes are duplicated in both area codes. Originally home to a number of switches including #1 and #5 crossbar switches and several Crossbar tandems (XBT). Right side of building has two microwave dishes pointing towards eastern Long Island.